Saint Frances, founder of the Congregation of Oblates of Mary in Rome, is one of the city’s patron saints, along with Peter. Her family lived in the neighbourhood immediately behind Sant’Agnese in Agone, and as an infant she was brought to the church for baptism. 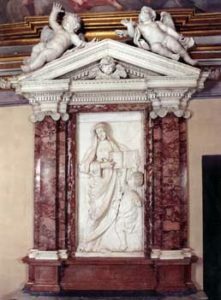 The Chapel of ‘Santa Francesca Romana’ features a marble altarpiece showing the name saint, flanked by an angel, as she points to the Gospel of Jesus. The sculpted panel is believed to be the work of Domenico Guidi. On the vault is a fresco attributed to Francesco Cozza, showing Saint Frances welcomed to heaven by the Trinity. Below the altar table is the stone baptismal font used for her christening, salvaged from the ancient church of Saint Agnes at the moment of the Baroque reconstruction.